Moving costs can add up quickly and saving money any way you can, especially when it comes to moving supplies, can allow you to save money for the tasks you can’t exactly cut back on. Before heading to the store to pick up supplies, write down exactly what you’ll need in order to pack up your home (i.e. scissors, packing tape, moving boxes, etc.) and try to estimate how many of each you will need. You might need to add to this list as you start the packing process, but at least you’ll have an idea for your packing budget. 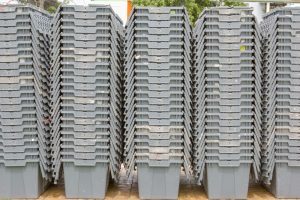 With many individuals focusing more on helping our environment, disposing of items through the correct channels, and reusing items whenever possible, plastic moving containers have been a huge hit with people moving over the last few years. The best part? You can rent them! This not only saves you money but also reduces the need for storage space you’ll need to store them for your next move. There are a lot of companies out there that provide plastic moving containers for rent, so be sure to do your research first! Utilizing used boxes to move smaller items such as books, nick nacks, and photos will make moving these items much easier. Plus, finding smaller boxes is extremely easy! Head to your local liquor store and ask to take a few of the old wine boxes or head over to Craiglist! You’ll be surprised to find how many people are trying to get rid of moving boxes (for free!) after a move. If you’re grabbing used boxes for a store or taking them off someone’s hands, make sure to avoid ones that are dirty or have soft sides to avoid them breaking! Before you start laughing at this idea, give it a try! Garbage bags are always our go-to when we move and we highly suggest them for our clients. Whether you’re popping them over clothing, packing up bedding, or utilizing them for other household items, the trash bags will keep your items protected and can be reduced to get rid of trash once you take the items out of them. Hate dealing with packing peanuts or bubble wrap? Both of these are necessary for protecting fragile items during a move but are bad for the environment and the cost of them can add up quick. Instead, utilize clothing, pillows, and towels to protect those breakable items during the moving process. Two birds, one stone! Whether you pick up scissors, tape, markers, and even new boxes at your local Target, Home Depot, or Dollar Store, you’re going to be receiving the same quality items. To help save a little extra money, stick to the Dollar Store (or any other discount store! ), KMart, or Ocean State Job Lot. You’ll be amazed at how much money you’ll end up saving and your move will go just as smoothly. To schedule your move with All Day Moving, give us a call today at (978) 682-2040.